These Rest of Season IDP Rankings are designed to give you an approximate value of a player's worth for the remaining games of the season. Having an idea of a player's future value will allow you to judge potential trade offers and waiver wire decisions in a more discerning manner. These rankings will be updated each Thursday to reflect injuries, playing time changes, role changes, scheme changes, etc. *Players listed in RED are currently injured or have recently been placed on IR. **Players listed in PURPLE are newly added players to the rankings or are players that have had an adjustment in their ranking from the previous week. ***The "Change" column notates if that specific player's ROS rankings went up or down from the previous week. If there is nothing in the column, the player's value remained the same as what was listed the previous week. 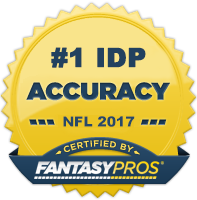 ****These rankings are based upon a balanced IDP scoring system.